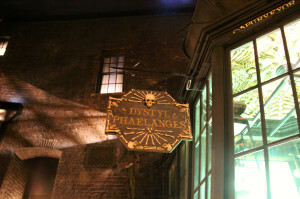 One of the best new interactive wand spells at Diagon Alley can be found in Knockturn Alley; the skeleton spell. Standing at the window for Dystyl Phaelanges, you see medical devices strewn about the base of the window and a skeletal chart forming the background of the window. Aspiring wizards and witches can stand in front of the Dystyl Phaelanges window and cast a spell to make that skeletal chart interactive! With a swish of your wand, the skeleton may be controlled by you; moving this way and that. The skeleton will dance; mimicking your own movements. Breaking things on the chart, moving them around, and generally having a grand old time. I’m surprised there’s not a line for this spell, but usually you just walk right up!